Student will be issued training completion certificate and 1 year trainee certificate. 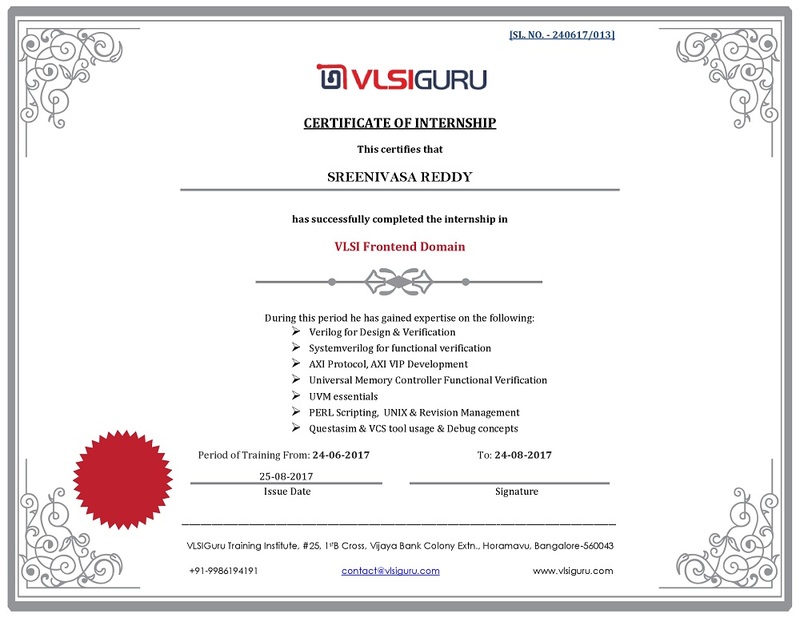 During ‘learning phase’; Student will undergo 4 months extensive training on Advanced Digital Design, Verilog, SystemVerilog and UVM basics, standard protocols like AXI, AHB, Ethernet MAC, etc. Student will be working on multiple industry standard project as part of SV & UVM learning. During ‘application phase’, Student will be working on industry standard project with trainer guidance. Same project can be used as MTech Project. Helps bridge the gap between graduate academics with industry requirements. Saves 6 months time spent on training after passing out from college. Helps them choose right project of ME. MTech & BTech freshers looling to make career in VLSI domain.